as i sit and write this post, i am 20+ videos behind schedule. this means there are videos from our recent past that have yet to be created and posted. why do i create these videos? 1. it is a journal of my life as a working musician. no smoke and mirrors, no huge budgets, no slick over produced videos…….just a simple account of each of our performances. 2. i hope that these vids may be of service to any other future aspiring working musicians, crafters, etc. i have been a full-time working musician for a little over 20 years. i’m not super wealthy, nor do i have a trust fund, or rich parents who give me money. this is what i do to survive. i sing for my supper. this lifestyle is not for everyone. yes, it has been very difficult at times, but it has also been a wonderful way to go through life. i like to be of service, and i enjoy providing a space and atmosphere for people to relax and celebrate. it’s my gig. it’s what it do. 3. these videos are a good way for us to advertise our services to potential customers. if you want to know what we do, just watch a few videos. if you like what you see, cool. if not, then more power to you! 2. Shiborigirl makes an appearance, joining us for a bowl of pho. 3. this is our first time performing at the Mai Tai Bar in Long Beach, California. fun place with a relaxed island vibe. 4. Parrotheads are always fun people to party with! 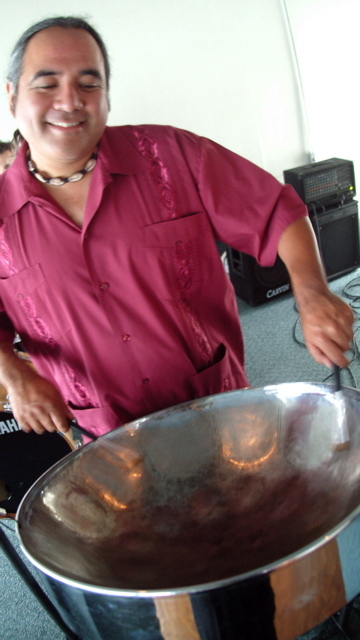 5. in this video, i hold the video camera with my left hand while i play steel drum with my right hand. they didn’t teach me this technique in music school. we like to read your comments!